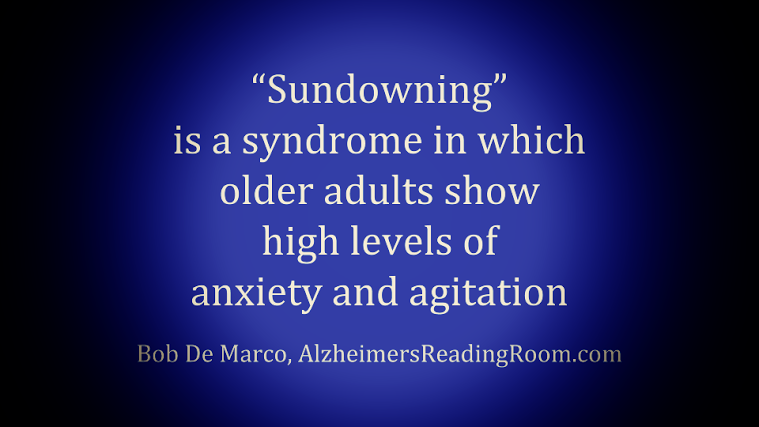 Sundowning is a major problem for Alzheimer's caregivers. Dementia patients can get aggressive and very disruptive. I found this research study interesting. I say this because I learned it is easier to deal with a problem and solve a problem if you first learn what is causing the problem. Understanding the cause of a problem provides a foundation on which a caregiver can build -- a necessary frame of reference. Late day, early evening, anxiety and agitation is somewhat common in early dementia patients. The problem is often associated with "sundown" or the time before a person would normally go to bed. Time of year and length of day can make a difference. 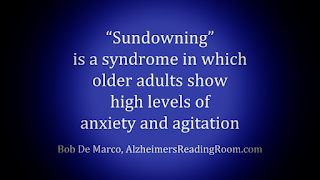 This research interests me because "sundowning" usually comes in a pattern. Around the same time of day. I did have this problem with my mother. How did I break the pattern? I substituted a new and different pattern that changed her behavior. I know this sounds simple. The new study found that aged mice showed significantly more activity and more anxiety-like behaviors in the hours before they would normally sleep when compared to middle-aged mice – just like sundowning in humans. The study appeared in the the Proceedings of the National Academy of Sciences. Other co-authors of the study were Kamillya Herring, an undergraduate student, and Zachary Weil, assistant professor, both in neuroscience at Ohio State.